When mapping photos onto flat faces, you can choose the easy way or the hard way. Unfortunately, the hard way is the method you end up using the vast majority of the time. 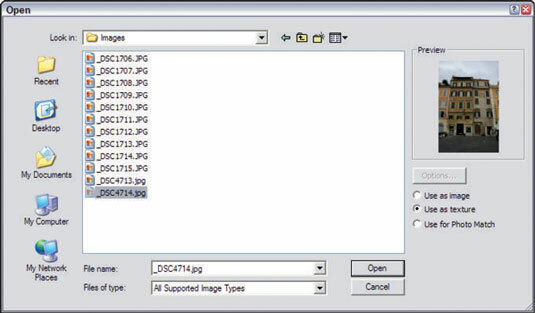 Importing images by using the File menu lets you take any image and map it to any flat face in your model. Before you follow these steps, make sure you have at least one face in your model; you map your texture to a face. 2Select the image file you want to use as a texture. You can use JPEGs, TIFFs, and PNGs as textures in SketchUp; all these are common image file formats. 3Select the Use as Texture option. Image textures in SketchUp are made up of tiles. To make a large area of texture, such as a brick wall, SketchUp uses a bunch of tiles right next to each other. In the case of a brick wall, it may look like there are thousands of bricks, but it’s really just the same tile of about 50 bricks repeated over and over again. 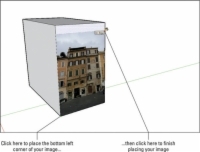 Because SketchUp treats imported image textures just like any other texture, what you’re really doing when you click to locate the upper-right corner of your image is this: You’re telling SketchUp how big to make the tile for your new photo texture. Don’t worry too much about getting it right the first time, though — you can always tweak things later. The Open dialog box closes, and Paint Bucket becomes your active tool, with the cursor loaded with the image you chose to import. 5Click once in the lower-left corner of the face you want to paint. Your click tells SketchUp where to position the lower-left corner of the image you’re using as a texture. You can click anywhere on the face you’re trying to paint, but I recommend the lower-left corner — it keeps things simple. 6Click somewhere else on the face you’re painting. Unless the proportions of your image perfectly match the face onto which it was mapped, you should see your image repeating. Don’t worry — that’s normal. SketchUp automatically tiles your image to fill the whole face. You can scale, rotate, skew, or even stretch your texture to make it look however you want.